Register for the Redding Rock 'N Roots 9k and 1 Mile Fun Run today! ONLINE REGISTRATION REMAINS OPEN UNTIL RACE MORNING. IN-PERSON REISTRATION IS ALSO AVAILABLE AT THE EXPO ON FRIDAY (7:00PM-8:30PM AT THE REDDING HISTORICAL SOCIETY, 43 LONETOWN RD) AND AT THE HISTORICAL SOCIETY RACE MORNING. 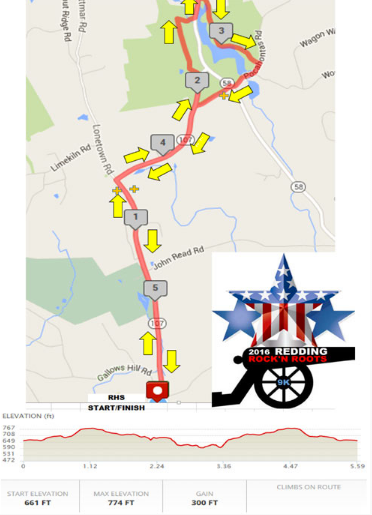 This course is runnable 301 ft of total climbs and has 3 aid stations along the course with water and Gatorade. There are bathrooms at the beginning and end and one in Putnam State Park, halfway through the 9k. All participants will receive a short sleeve tech shirt or a singlet and other great gifts. Finishers will also receive a medal. The 1 Mile (or less) Fun Run, which occurs after the 9k (around 9:15) runs through the back of the Historical Society to the grounds of the Community Center.This untimed race is open to all ages, can be run or walked and can be shortened to any distance less than 1 mile.